I’ve found in my life, vulnerability is the biggest solution or point of relief for me when I’m facing overwhelming adversity, anxiety, anger, or an affliction. Vulnerability keeps me open. It makes me more likely to find empathy for myself and others, rather than close off and try to avoid my own emotions, or the emotional weight of others. Both can be equally hard to experience. It can be a truly frightening thing to fully feel your emotions and the emotions of others on a day to day basis. But, contrary to the “stoic” image of strength that has persisted for quite some time for both male and female, I have found that I become more and more weak and disconnected by “steeling” myself and my emotions against the hard times. My struggles are far easier to overcome when I can reach a point of acceptance sooner. The pain resides, I see the situation for what it really is, I start looking for solutions, and I go into action to make things better. I am able to do this when I embrace my vulnerability on a regular basis. 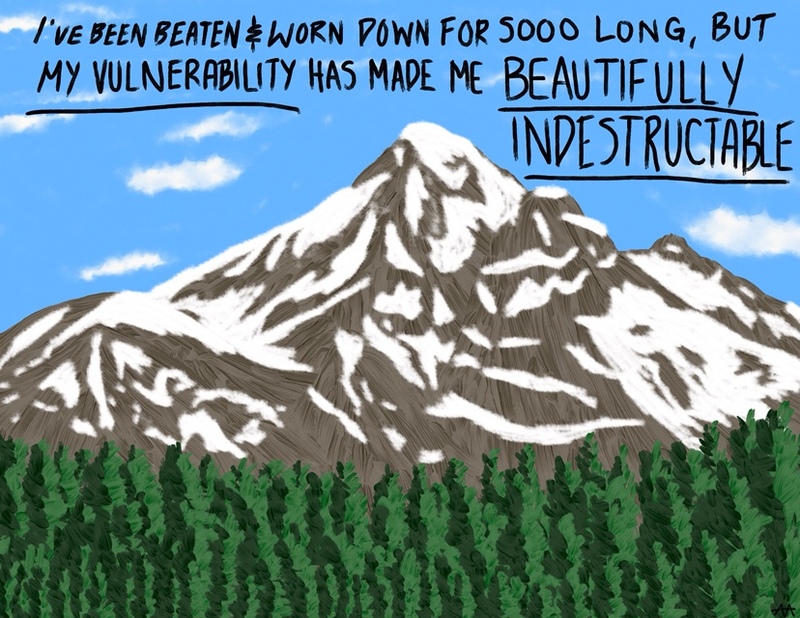 Overwhelming elements or visuals of strength like a mountain remind me that vulnerability comes in many forms and that it is an invaluable tool that is always available to me.